Hello everyone! Thank you for joining me for the March Challenge! Also, thank you for being patient while I was sick, for me to post it. Our month time frame has been cut to 2 weeks, but I have every confidence we'll get lots of entries. Being sick for the first half of the month, I obviously didn't make anything during that time. I also took it easy over this past weekend because I was so far behind in my housework, my real job stuff, and just didn't have any inclination to head in to my craft room. However, today, I saw a card on the Unity Stamps website that really caught my eye and inspired me to make my challenge card! Here is the card I created from that inspiration. I thought that keeping the focal point all white, while using beautiful coloring in the background was so clever. I had never thought to do something like that and it turned out to be quick, fun, and I feel like I can create a bunch for Easter. Create a card with a white/black focal point and a colorful background. You may use any coloring medium. I used distress oxide ink on watercolor paper. Have fun with alcohol inks, watercolors, colorbursts, distress inks, distress oxides, Zig markers...whatever you choose! I hope you enjoy playing as much as i did! 1. All MISTI Monday Challenge Entries must be uploaded to your member gallery, with the specific challenge keyword, no later than, Friday, March 29th, 2019 at 12:00 Noon Central Time to be eligible to win a $50 gift certificate to My Sweet Petunia! The winner will be announced Sunday, March 31st, by Midnight EST. 2. You may combine this challenge with other challenges, and also have multiple entries. Please use a full description on either how you used your MISTI or, if you don't own a MISTI, how you would have loved to incorporate its help! snowmanqueen, giogio, annsforte3 and 2 others like this post. So nice to see you Misti Monday! Glad you are feeling better!! Thank you so much! So glad to be back! So glad you are feeling better Misti Monday! What a fun challenge! Glad you are back...and I like this design...I need to make some cards for donation (next one is in May) and I can see this to be a layout for several cards. Happy Tuesday Misti Monday and glad that you are feeling better. Love this challenge. Hawaiian and Ozpom like this post. I'll try again because I can and we know I already have more than enough supplies! Glamour, Hawaiian, CraftyCouple and 2 others like this post. I know I feel like I have a craft store in my home. That's exactly how I want it...laughing. I did a major clean up this week and I'm so excited...it looks soooo nice. But I know it's going to be short lived. I'm the messiest maker. But it's FUN! I'm going to make more of these cards this weekend. I hope. Time to go for a walk right now. Hawaiian, Ozpom and JRHolbrook like this post. I tried to look to see if anyone had uploaded a card. It's not finding that gallery. Did anyone try? Did you find the gallery? Can someone try and let me know? I'll have to figure that one out, if it's not there. contrapat and Hawaiian like this post. From my uneducated guess I say that no one had uploaded a card with MSP19 as the keyword yet...but keep checking, today is Saturday! My day has been a completely successful day doing all of which was not on my list or my desire! The USPS has implemented an emergency suspension of the following Post Office...and then listed our town! Now that was a shock. I have my card in my minds eye and since I’ve lost my marbles lately I can find it yet to upload Roflol. Maybe Sis Jayne got it other there in Oz? No uploads yet. I made some backgrounds the other day and I was waiting for them to dry. I'll try and finish them today after mass, and I'll upload tonight. Once someone uses the keyword, it should start the gallery. Hawaiian, CraftyCouple and Ozpom like this post. Lets try this again! I could not get the link to work on the last post! I’ve started a BG but won’t get back to it for a couple of days as we have things on. Faye, why an emergency suspension? Hope the gallery thread now works. Gorgeous cards ladies what I’ve seen so far. Sis Vicki...I need marbles lol. I still haven’t bought some for the rolling marble challenge. Did anyone create yesterday? I did. I used my Misti lots as I made a few panels trying to work out a design for a friends birthday. I have 2 cards to choose from but when I am sending cards I’ve made, they have to be just right. I’m so fussy lol. The good news is I didn’t get ink on any of the panels...only where I wanted it lol. I still want to order the magnets and corners....maybe our local craft store can get them in for me. CraftyCouple and Ozpom like this post. Here's my first card for this challenge. I enjoy making my own backgrounds but have always used a clear block, decided to use the MISTI by filling the space with paper to raise the cover! It worked very well in my opinion! Used the MISTI to stamp the image to get a nice ink look! Stickles on the flowers! Use a colorful background with a black & white focal point. So happy to have my MISTI to create a beautiful, dark black image to contrast with the background. Having fun with my MISTI. Question: How do you ladies clean your stamps when they are on the MISTI? I don't like to use baby wipes, so I carefully remove them and place them on my stamp and scrub. Then I grab my clear block to be able to move them back and forth to clean them. It sure seems like I'm doing too many steps. Any suggestions? I dry my wet stamps with a paper towel. I have a black stain that was there before i started using the stazon...oh well, it is a very used item in my stamp room and I don't mind seeing the evidence of use! Now going to make a third one tonight! I enjoy making backgrounds and now that I figured out how to use the MISTI rather than a clear block I'm overly happy! Sally, I use baby wipes. I have 2 stamp cleaners and rarely use them or the spray...I just wipe m8 e clean with a baby wipe or with water and had no,problems. Some stamps are coloured, especially after using black but I don’t mind that. They are loved. I just check them when I start stamping so I don’t get black on my cards lol. Aww Sis I’m So sorry :0( ...it’s a gifted die cut I don’t have the die but I understand perfectly how you feel it is a absolutely gorgeous thing of beauty!! Plus if I owned the die I would more then happily cut you up tons ..so sorry!! My second attempt at the Textured Alcohol Ink Background technique for this challenge! I used my Mini MISTI for stamping the sentiment on the vellum with Versamark--sure to get good, all-over coverage with the MISTI, for a great heat-embossed sentiment. If I found our what the die is I would buy it myself because Santa hasn't been a part of my life since I was 4 years old...I had an unkind brother! Though I have gotten a FlyLady duster and calendar that I have no clue to this day who sent them to me (2 separate gifts) but it certainly wasn't Santa! Hey Liz...fun to see you here! I'm just using ink because I don't have alcohol...I enjoy making my own backgrounds, have a fun time...and I might just send you a pm next week as I will be taking my favorite cousin who is visiting from Australia to a quilt store in your Small Town, USA! Yesterday I used my MISTI for sentiments as well as the ruler for making the sentiment cuts on another card! LizBeth1976 and Ozpom like this post. I just loaded two cards to the challenge. I had so much fun playing with background techniques and I love the look of the simple black and white focal image. 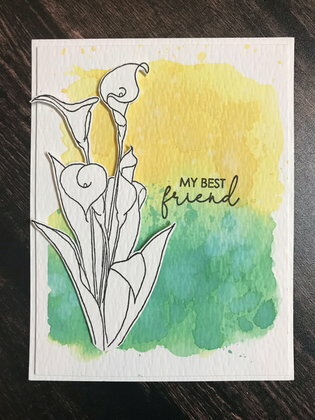 Not sure I will have time to make another card before the deadline but if I do, I'm using my MISTI as a clear block and making another fun background...with Distress Oxide inks this time.